We sat down with Paul Thompson, HenkinSchultz’s Media Buyer, and asked him some tough questions to get a better idea of how media buying works. A little background on Paul: he graduated from South Dakota State University with a B.S. in Mass Communication/Advertising. His first job out of school was at local television station KSFY, where he grew digital and TV sales, and helped in designing and laying out the Pigskin and Basketball Preview magazines. Later, he went on to Results Radio/Townsquare Media where he became Digital Sales Manager. In 2016, Paul joined the HenkinSchultz team. His prior experience in TV, radio and digital sales afforded him a smooth transition into his current role as Media Buyer at HS – placing multi-media campaigns in an effective and efficient manner. How do you determine the best avenue for a client to take when it comes to media buying? The medium chosen 100% depends on the message and who we are speaking to. Today there are so many options people have in how they consume media, it is incredibly important to choose the medium that hits your specific target. The most effective campaigns today figure out a way to engage the audience by meshing your message into the actual content that the target audience is consuming. What is an essential aspect or role to have as a media buyer? Networking is incredibly important. Having strong relationships with all of the media reps I work with is a huge part of my job. Coming from the sales side of the industry, I kind of know what they go through on a day-to-day basis. So that helps me know how to work in a way that makes both of our lives easier, which essentially evolves into better marketing campaigns for the client. Media reps have hard jobs, and there are a ton of very talented reps, especially in Sioux Falls. It is fun to work on a project with professionals knowing we both have the client’s best interest in mind. ”Our ongoing relationships with local, regional and national media companies afford us opportunities for our clients that are not necessarily available to them as an individual business. Why should a business go through an ad agency like HenkinSchultz to buy ad placements? There are several reasons to place ads through an agency – first and most obvious being that we are professionals and this is our craft. I eat, sleep and breathe media. The various forms of media and the way content is being consumed today changes so quickly that it is extremely hard to keep up with unless you study it every day. Being able to identify specific media that will benefit your marketing goals, compared to other forms that may be less effective and a less efficient use of your money is not easy today. Another big reason is that our ongoing relationships with local, regional and national media companies afford us opportunities for our clients that are not necessarily available to them as an individual business. The above video is a Screenflair :60 second TV spot placed on various networks in 2017. In a community the size of Sioux Falls, do Neilson Ratings have an impact in your research and media buying? Neilson Ratings are a nice tool to use in creating media plans, but especially in a diary market, like Sioux Falls is, they are not what I base my final decisions on. Growing up in the area, I know the local media so well I like to say I buy audiences and not ratings points. I do keep track of all of the ratings and if there is a surprising number I will stop and do more research as to why. I guess in those cases the ratings will potentially affect my decision. However, Sioux Falls being a market that relies on diary entries to compile the ratings, there is a certain amount of user error that needs to be taken into account. If I were putting a media plan together for a similar market that I am not as familiar with, say Des Moines, IA, for example, I would lean much more heavily on the ratings. Also, larger markets that have automated ratings are much more precise and therefore those ratings weigh heavily into my decisions. What do “ratings points” really mean and why do they matter? Ratings are basically a form of measuring the audience that is viewing or listening to a program. A ratings point is a percentage of the market that will be exposed to a specific program, station, or daypart. If a certain show gets a 10 rating, it means 10% of the market will consume that show. Neilson Ratings Points are the basic currency that radio and television is valued through in order to buy and sell ad space. There are other companies that compile ratings, however, Neilson is the most widely used system. 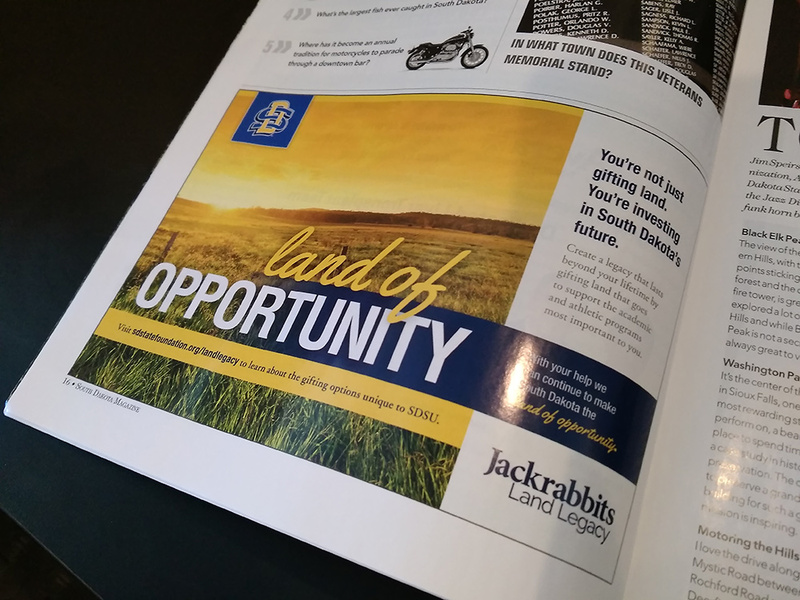 SDSU Foundation Advertisement placed in South Dakota magazine May/June 2017 issue. How does a media buyer stay on top of trends with media placement? The way people consume media today changes so quickly with new technology and changing lifestyles, keeping up with the media climate is a very important part of the job. You have to have a passion for the craft, otherwise you will be left behind. Keeping up with trends helps you to know when and where a message will be warmly received rather than blocked out by your target. Content is king, and finding ways in which you can fit your ad within the content the audience is consuming so that it doesn’t scream advertisement is very valuable. One of the easiest ways to keep up is to follow media trendsetters on social media. Some of my favorite follows are Jason Kint (@jason_kint), Rob Norman (@robnorman) and Katie Morse (@misskatiemo). What is the most exciting part of your job as a media buyer? My favorite part of my job is what I call “putting the puzzle together”. After we have gone through all of the research of identifying the campaign’s objectives and who we are talking to, I take all of that information and put media plans together that will effectively and efficiently deliver our creative message to the target audience. Seeing that final puzzle in market and effectively driving results for our clients is the reward.